A gorgeous pair of bespoke hand carved Gustavian style 'Lotta' bedside cabinets featuring; galleried tops with shaped sides, concealed pull-out table slides, vertically reeded cupboard doors with reeded drawer below, fluted sides, and elegant square tapered & fluted legs. 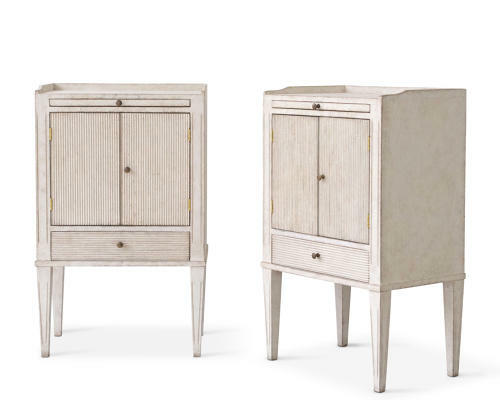 These beautiful bedside cabinets are historically accurate renditions of 18th century Gustavian period nightstands, and are available in a range of authentic Swedish hand painted antique patinas. Please email enquiries@georgialacey.co.uk or call 00 44 (0)1892 516 850 for more information. N.B. Export sales to the USA and other non EU countries are NOT subject to 20% VAT.